This knowledge base article is intended for users who are new to configuring Assetto Corsa Servers. 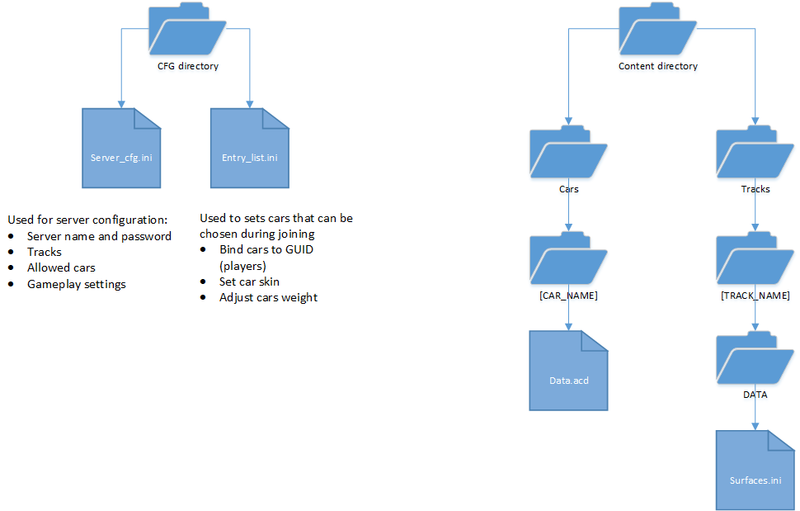 In this knowledge base article you will learn: where the server settings are stored (server name, tracks, cars and other gameplay settings) and where custom tracks and cars need to be uploaded. The usage of Microsoft Windows and are familiar with the concept of folders. The use of notepad or another basic text editor. We also assume you already know how to use the control panels file manager or how to connect to the server with an FTP client to edit files and upload them. Assetto Corsa server exists of multiple files and folders, luckily, we only have to edit a few of them. The CFG directory, which contains all the configuration files used by the server. The content directory, which contains the cars and tracks. Important note: The cars in the entry_list.ini need to be set here for the server to work! The type of race (race, practice, qualification) and the number of laps and duration. Other gameplay settings such as assist like ABS, traction control, etc. The Entry_list.ini file is used to set the cars that players can choose from when joining the server. Important note: The cars set here also need to be added to the allowed cars in the server_cfg.ini for the server to work! The content directory is where you uploaded custom cars and tracks. In the car/track directory you will find a couple of cars and tracks which ship with the vanilla game, if you wish to use DLC or custom cars you will have to upload these. Note when using custom content: Players are required to have these files on their computer, otherwise they can't connect to the server because they get a unavailible content error. You can save a lot of time, bandwidth and disk space (which is limited to 1.5GB on the server) by only uploading the necessary files to your game server. For custom cars, this usually means you have a folder with the car name, which only contains a data.acd file. In some cases you may also upload a DATA directory in the car’s folder. We assume you’ve already uploaded the tracks and cars which you want to use, if not please see the paragraph above. The server_cfg.ini file contains most of the server settings. We won’t go into the details of what each setting does. Most settings explain them self or are already documented inside this file. Now you can edit the entry_list.ini file to add the car, this will allow players to choose the car when joining the server. There is a typo in one of the configuration files, which means the server can’t find the car or track. An invalid value has been specified in the configuration files. Custom content hasn’t been uploaded to the server yet. You forgot to add the car to both the server_cfg.ini and the entry_list.ini, or the car names don't match (typo). Please double check to make sure you haven’t made these errors, you can also check the console.log (in the log viewer on the control panel website) to look for any error messages which indicate that the server can’t start. If this still doesn't work you might want to use the server manager to create config files instead. Configuring the server can be done by editing the server_cfg.ini and entry_list.ini files directly, however inexperienced users might find it easier to create a configuration with the server manager. The server manger is a GUI tool which allows you to create server_cfg.ini and entry_list.ini files which are valid.